King Kong 2005, New Zealand. Genuflex MKII, MkIII, and Zebra systems. BMW commercial 2009, Los Angeles. Genuflex MK III, 42 ft diam. curved track. Lexus commercial 2009, Los Angeles. Genuflex MK III, curved and straight tracks. Flightplan 2005, Los Angeles. 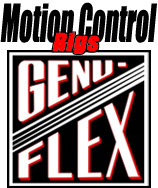 Genuflex MK II. Apocalypto 2006, Mexico. Genuflex MK III. Book of Eli 2010, New Mexico. Extendomatic Jr. and 30 ft diam. 360º curved track. Valley Children's Healthcare commercial 2015, Madera, CA. Genuflex MK III. General Lift rents and sells precision "live action" motion controlled visual effects equipment for use with traditional motion-control shots, as well as in conjunction with computer-generated imagery on location, and on the effects stage. 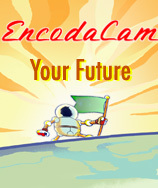 General Lift provides the EncodaCam: an on set real-time virtual set service, using production cranes, dollys and heads. Simply stated, our service will allow filmcrews the ability to see all that they will be filming, both foreground and background on a blue or green screen stage using the same dollies, cranes and heads that they use when shooting non-visual effects shots. 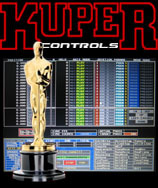 Oscar® Winning Supplier of Motion Control for Motion Picture Visual & Special Effects & Industrial Applications. We are please to have been involved in the production of "Anomalisa", a stop-motion drama film. It was released on Dec. 2015. 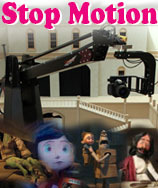 We have many different rigs of all sizes for every aspect of your stop motion production. Copyright © 2018 General Lift Internnational Inc. All Rights Reserved.